Passing through the eye of a needle… that’s what I feel right now. For one year we have been working on this dream like an ant working its way up a tree. Many times I have doubted if this was in accordance with His will. I have even questioned my motives often times but I am assured up to now that I have no negative intentions. But here we are now, at the last stage. We have not achieved the dream yet but at least we have something to hope for. Waiting could be painful but where we are now is so much better than the stages we had been through. Within the one year that passed there had been many struggles: deadlines, restrictions, problems that seemed to hinder us. I remember having felt so frustrated being helpless. But every time I was on the brink of giving up, we beat the deadlines and we succeeded each critical parts of the process. The last part had been a close call too, a few days before the deadline and all our efforts would have been wasted. Back to zero in my opinion, and I’m not sure if I’d be willing to undergo the process again. Time and money had been spent. Of course, I know there will still be another way just like the times He had helped us succeed each deadline. It is I who doubt if I’d be willing to take the effort again. As I have said about myself, I am not the most positive person on earth. So you would know how thankful I am now that the efforts are done and almost over. Though I can not really make you realize how I feel at the moment, now that we could start waiting, anticipating, to finally have hope. I could say now that whatever the results would be, in a way we have succeeded. So thanks be to God. For the past 21 years of my life I have known her, 15 years as my best friend. We were just 7 when we first met each other in Mang Santos’ service. I still remember her as the girl with curly locks because I used to wish for those curls too (hehe). 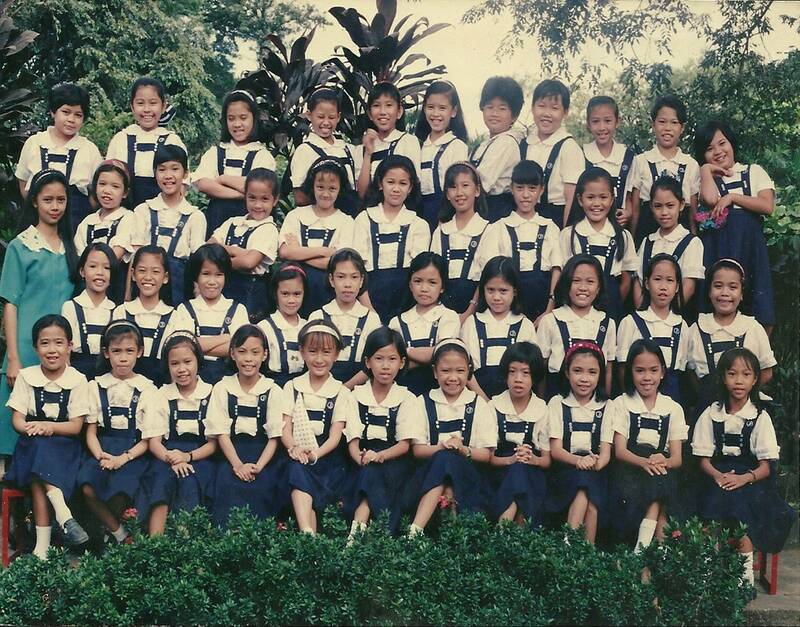 For me, she was the prettiest girl among the 6 of us, Grade 1 girls in the service although I didn’t feel that time that she thought the same about herself. Lorraine was a shy and modest girl even when we were young. She wasn’t my closest friend then. Not yet. Back then, they were all even to me. As a child, I felt that Lorraine and I differed tremendously. She was the studious type and I knew she was intelligent because she consistently belonged to the star sections while I was just average. Being the eldest sister too, I had the impression that Lorraine was serious type so I got a little shy to approach her, afraid that she’d be appalled by a bit of my mischief. 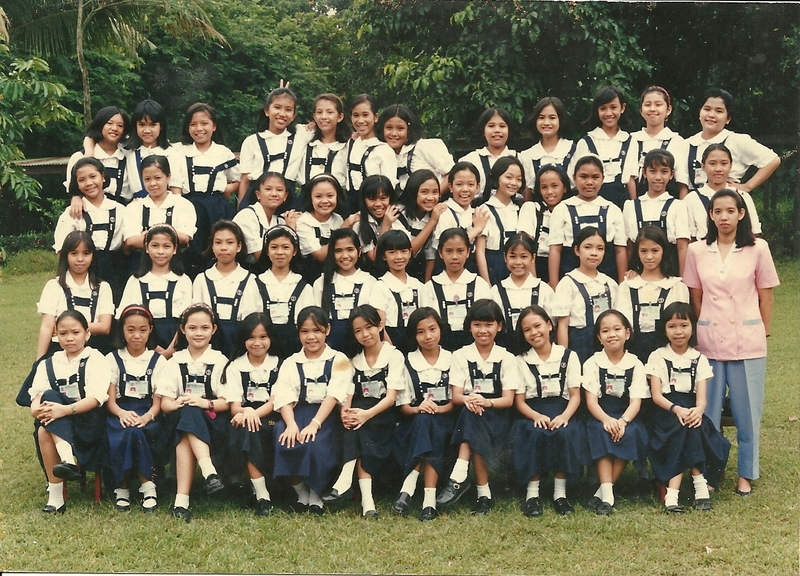 When we became classmates in Grade 6, my perspective changed. Lorraine was a good friend, no doubt, but I realized we have lots of common interests too. She was an enjoyable company and her humble attitude completely erased the “serious and strict” impression. I felt most comfortable with her than with anybody else. 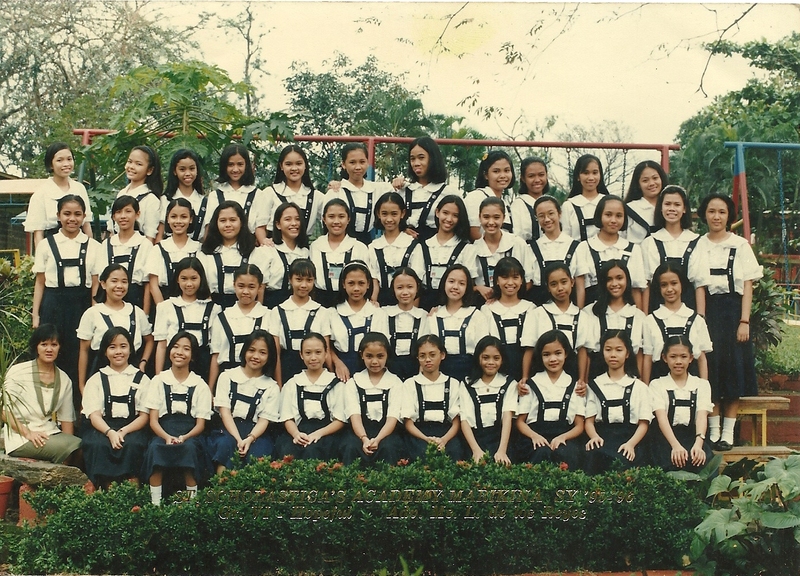 By first year high school, Lorraine and I became very good friends. We were classmates again and were practically always together such that most teachers had mistaken us as sisters or even twins. That was when we became best friends. So who is Lorraine? Bes, as I fondly call her now, is a person who has a good head on her shoulders and has maintained it that way up to now. Her opinions on significant issues or casual discussions were never meaningless. I had often been a beneficiary to her sensible advices, especially during the dark ages. Many times she may seem uptight but I’m assured a good humor has been well-tended inside and continuously improving. She has been sharing her clever jokes for as long as we’re together. We’ve shared many a good laughter about innocent waiters, passers by or victims as we generally call them (hehe). Bes could get a little crazy too. After all, no friend of mine is not without a little hint of it (haha). Behind her delicate façade, Lorraine is a strong person. She knows very well her goals and has always been determined to achieve them. 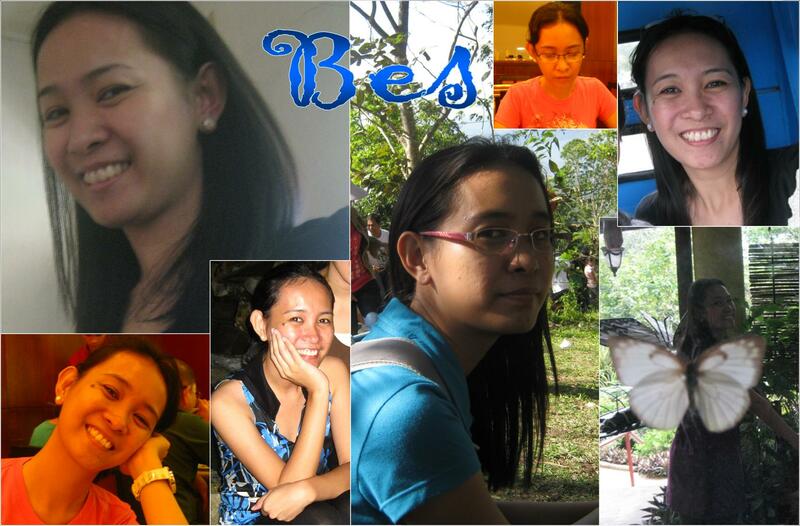 Indeed, Bes had gone far in her journey through life. Graduated highest in her department at ADMU, currently juggling her job, sidelines and MA in UP all at once, and just recently, passed the boards, her goals in life become more confirmed and I can see them start to unfold step by step, one by one. She’s quite a published researcher and editor now and I can’t help but beam with pride whenever I see her printed name as if it was my own. 🙂 Her conviction to her ambitions is really firm and highly regarded. More than a friend, I felt that I have a second sister in her. Not many people find their soul-mate in friends and I thank God for giving me this experience. Last Friday, June 10, I turned 28. Although it was my birthday, I didn’t wake up unusually excited. For me, it was just an ordinary day. I was contented just to see my dear and kids, first in the morning, when I woke up and that was more than enough happiness. I didn’t even take a birthday leave. I went to work and was busy because the 10th marks the deadline for monthly FS. Fortunately, I completed the report right after lunch and by 4:30pm, I couldn’t wait to go home and be with my beloved family. On the way, I was thinking of stopping at Ever or Big-R for a cake at least to treat the kids but I was reluctant at the same time. This would delay me and I really couldn’t wait anymore to be with them so I decided to just head home and postpone the buying of the cake for later. The table was set. It was just a simple dinner of spaghetti, chicken and fries plus cake for dessert but the effort really melted my heart. 🙂 I am so lucky to have such a sweet husband. 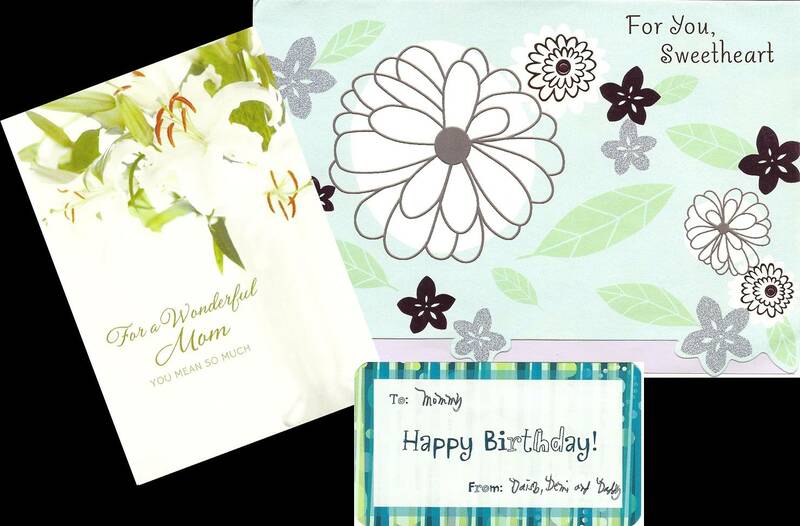 Not to mention, the red roses and cards. 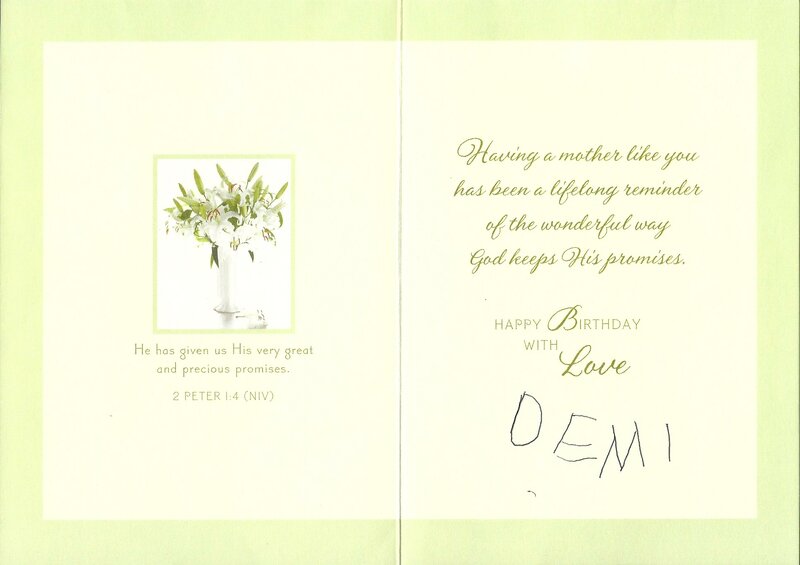 Demi's 1st time to write her name all on her OWN! So far, this is the most unforgettable birthday I’ve ever had. This was my first birthday that we were complete as a family. And I thank God for giving me this gift. June’s here, summer vacation is almost over. It’s been a long while since I have last felt that drastic change of mood when June sets in. Now, as I walk down the Memory Lane, mixed feelings of anxiety and anticipation creep up my stomach again and I had to smile at how simple life was when I was still a student. By this time, I should be changing the nocturnal habits, bidding goodbyes to the noon time shows I so ardently watched, extracting the dusty school bags from closets (unless Mom buys me new ones), and cleaning the school shoes that’s been inhabited by spiders. It makes me nervous just thinking about homeworks again, for St. Scho was much known for giving assignments even on the first day of school (hehe). Nevertheless, it’s exciting to see friends again and share stories about the summer vacation. More than 20 years ago, I was introduced to the world of St. Scholastica’s Academy, which became my second home for 11 years. As a little girl of 6, I was intimidated by the vastness of the school grounds and believed I’d never get to know my way around. 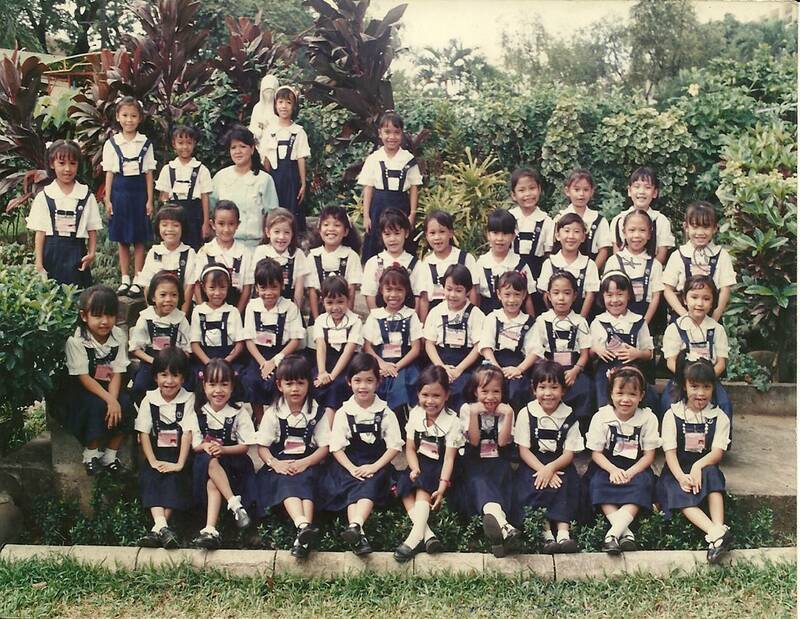 But I got out of St. Scho knowing the place like the back of my hand. It’s fascinating to realize how familiarity could make something big look small. But it’s even more amazing to think now, how such a small school ground could house a million memories, person by person, year by year. This is my memoir of some childhood memories as a Koolasa, each class owning a special contribution. I think the classrooms were still in the Octagonal Building, except that the Preps used them in the afternoon, while Grade 1 pupils used them in the morning. This photo was taken along the Grade School Building though. How embarrassing, I looked like a sickly kid, haha. When I was in Grade 1, I transferred to a new service shuttle since we had moved house, too. We were quite a group, I, Lorraine, Jacqueline, Bem, Jennifer and Elaine. After school, while waiting for the service to arrive, we usually play Chinese garter, ten-twenty or one-by-one. I believe our Adviser’s name was Mrs. Pineda but I do not remember much. Except that I think, this was the period I became exposed to books and adopted the reading habit because I always had nothing to do at home after school. Both of my brothers were in school, dad was at the office and mom usually took naps. So it was I and the homeworks, plus the books. I also recall the major 1990 Luzon earthquake during this time. I was outside the house alone picking flowers and catching dragonflies but little droplets of rain started to fall so I decided to go inside the house. By the door, I could see the washing machine shaking but this was no surprise. Sometimes, mom would put in too much clothes inside the spinner such that the machine shakes tremendously when turned on. But it was strange that even the dining table was shaking and so I told mom. I thought it was just the effect of the washing machine. When I saw her reaction, I got frightened, though I do not understand what was happening then while we were hunched underneath the Narra table. When the quaking stopped, we went outside and mom was staring into space while she continuously prayed that no after shocks happen. The photo was beside the Playground near the Gate 1 area I think. This was the era of one length hairstyles, hehe. 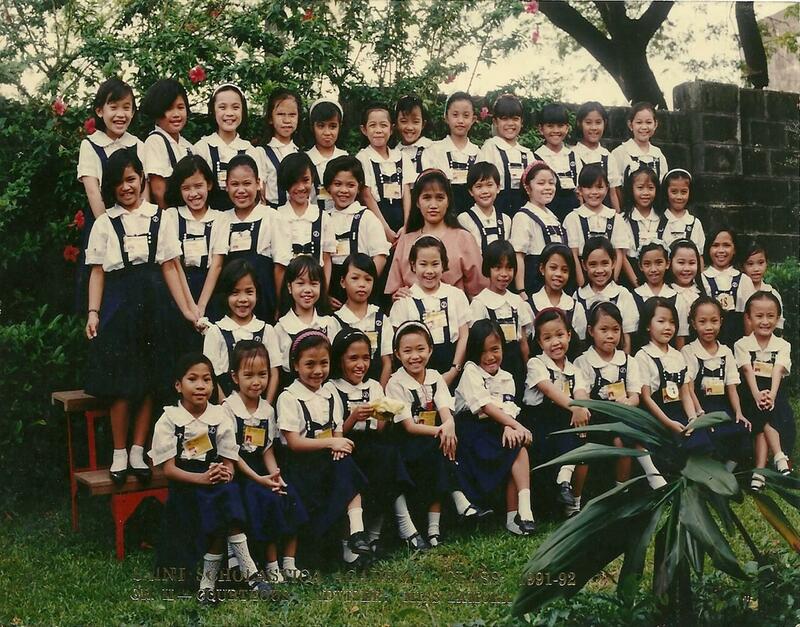 This was also the time when we took our first holy communion and our class adviser was Miss Zamora. I had a vague memory of singing Wind Beneath My Wings for Music class, because everyone was asked to. It took guts to do that of course, especially since I don’t sing anywhere except in the bathroom hehe. It had to be done though to discover the kids with talent. I guess this was the time I also first heard the Ugoy ng Duyan (and loved it), it might have something to do with our first holy communion. Aissa was probably the one who sung the song, for she was one great talent in our batch. As a matter of fact, my parents recognized her when she sang again for graduation (I hope I’m remembering things right ;)). 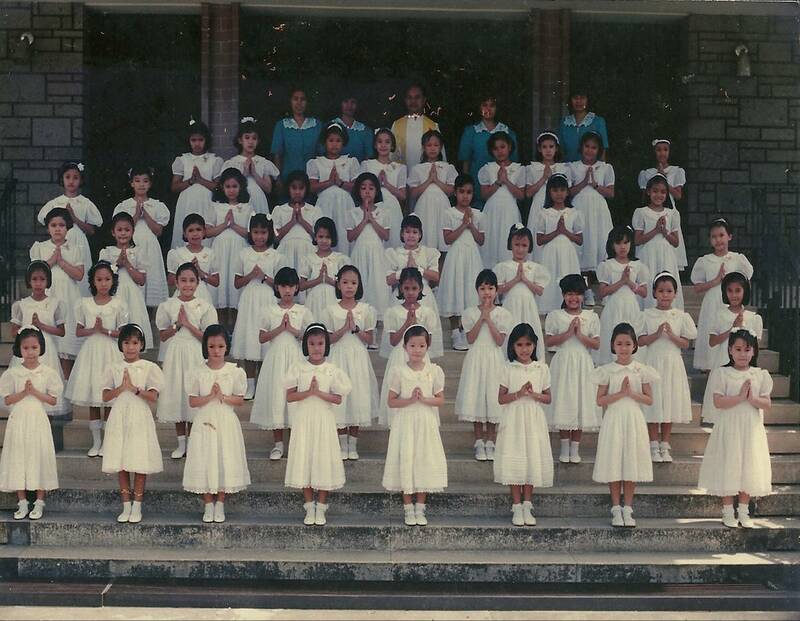 Look at how behaved little girls we were, wearing all white from dresses to shoes to accessories. So behaved actually, that I didn’t even dare fix my headband during the photo shoot (haha!). Underneath the white disguises though, sassiness never ceased to dwell hehe. Photo was taken near the Gate 1 Playground, too, maybe. I forgot the name of our adviser (sorry Miss *blush*) although she was one of my favourite teachers and I find her very pretty. To compensate the memory loss, she used to teach Filipino subject (there I remembered). If I remember it right, this year was the reign of Multiplication Tables. I used to dread that Multiplication drill wherein each girl in a group (grouping was per column according to seating arrangement) took turns and beat each other in multiplication. Karen took the limelight as she casually gave the answers as if she was eating cake, beating the rest of us of course. I learned that instead of counting sheep to sleep, she multiplied numbers in the cards held before her by her mom. Wow. As for me, I wished to just melt or be swallowed by the ground. I remember too, that this may have been the start of the Slum Book trade among the students, and the competitive research on the latest acronym dedications like J-A-P-A-N (Just Always Pray At Night), I-T-A-L-Y (I Trust And Love You), 7Bs (Books Before Boys Because Boys Bring Babies haha), as well as original mottos. I used to write “Time is gold” and the ever determined “Try and try until you die (which was supposed to be succeed hehe)” but the moment I encountered “What is beauty if the brain is empty?” I never changed (hehe). School was for a whole day from Grade 4 onwards. I don’t remember exactly if this was the time that I first experienced becoming a student teacher. We taught younger level classes, Grade 2 perhaps, paired with a representative student teacher from the same level. I got paired with the very charming daughter of Mrs. Bulan, I forgot her name (was it Nicole?). She was a brilliant student teacher but she’s a bit shy with the other sections so I had to take over for her. So far that was the only experience I had as a student teacher. The spot was at the lawn beside the Gate 7 and just about behind us to the right should be the old music room. My hair was flying away on both sides now and though we were starting to become “young ladies,” bangs were still in. Campaign for “Speak English” was getting strict. We were even encouraged to widen our vocabulary through a word game, wherein one student would give one clue to a word each day until one student gets the answer. Since this was the popularity of Sara Crewe, I got inclined to French words and one time, tried to play the game giving the clue “French word meaning front.” This was easily cracked since FRENTE was also the name of a popular band back then (remember BLT? Not bacon lettuce tomato, hehe, more like bizarre love triangle). And we’re back to the favourite spot beside the Gate 1 Playground and it’s funny how my hair flied away on just one side now hehe. 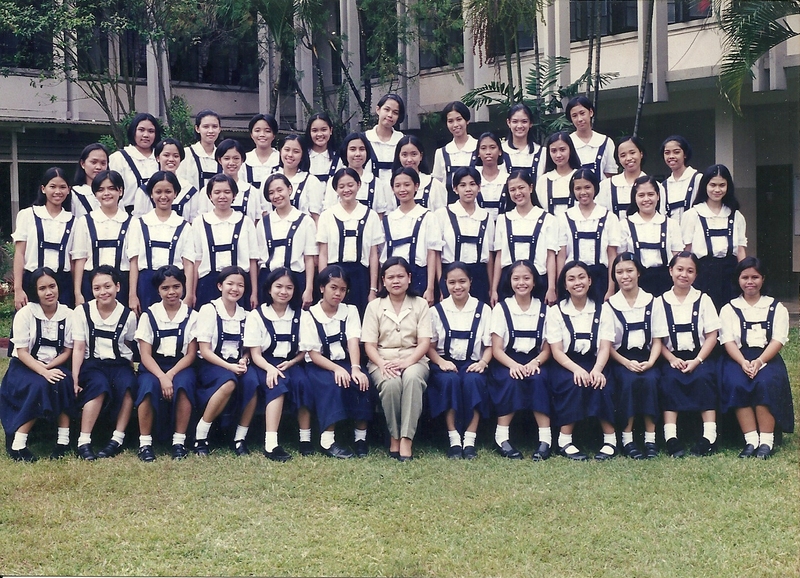 This was the first year I ever belonged to the star section headed by Miss de los Reyes, and the first time I ever became classmates with Lorraine, although we have known each other since Grade 1 because we rode the same service. By the way, Bes often belonged to the star section. Although I’m not sure if star sections were actually announced, we figured it out anyway since the most brilliant students obviously belong to this class. So this was the first time I have gotten to know the popular ones, and my belonging there must had been a mistake (hehe). It was a nice experience though, and I realized that while they were really talented and intelligent, they were very down to earth people, much like us average people. One of the new things in 1st year high was the library. While Sweet Valley and Bobsey Twins were popular in Grade School, there were fewer fiction books in the HS Lib. It was still big, but not as big as GS Lib. Nevertheless, countless recess, lunch breaks and dismissal times were eagerly spent there. In 1st year, we used to line up along the benches at the high school grounds. 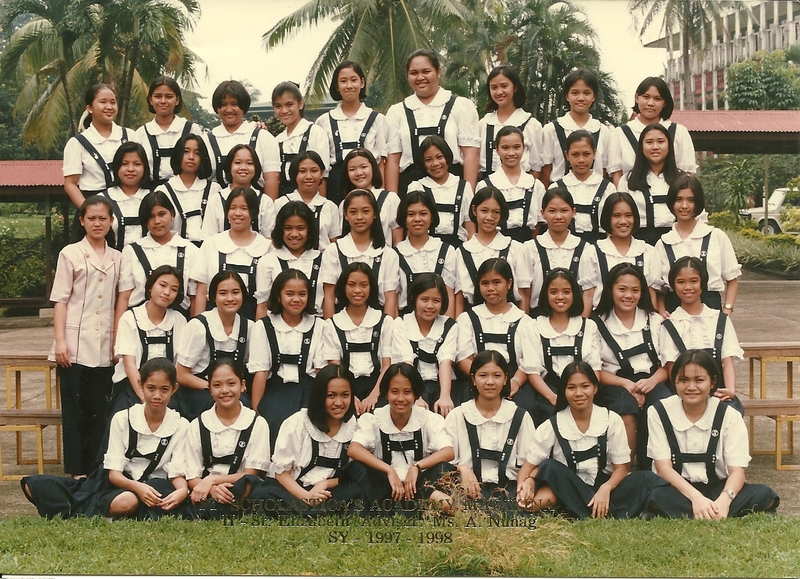 I always looked forward to chatting with friends before the day started, namely Bes of course, Didith, Maro, Pauleen, Jewel, Fern, Lady, Wowee, Jamie, Vanessa… I could go on and on, but I’m not quite sure if the rest were from another year’s classmates. I remember anticipating THE classes too, especially the group cooking. My favourite of all was the time we made baked mac. Pastas were my favourite even up to now. 🙂 We also made butter cookies but I recalled ours were perhaps a little too watery, the mixture wasn’t firm so it was difficult to shape it with cookie cutters. Nevertheless, the cookies were yummy! 😀 Later on, when dad bought our 4-burner stove with baking oven, I coaxed mom to bake cookies but I never really got the correct texture of the cookie batter. We enjoyed the shapeless butter cookies though. Thanks to THE’s practical lessons! 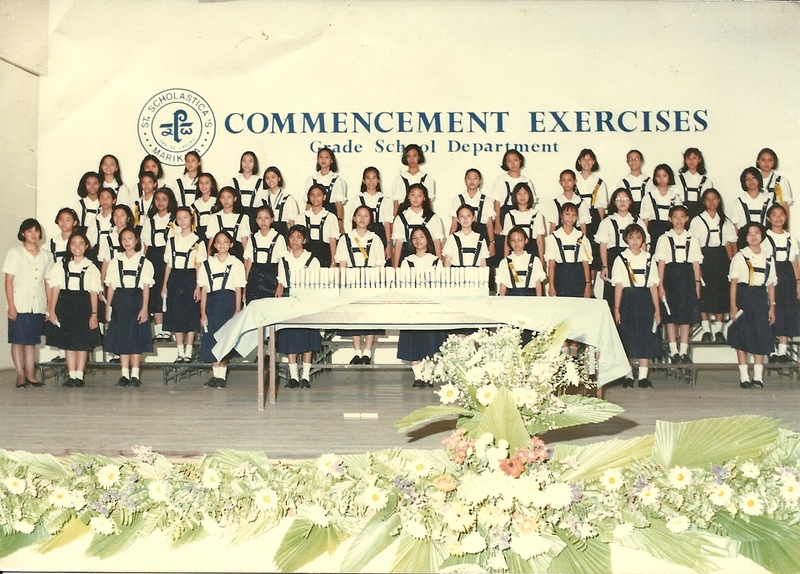 I remember too, that this was the year that each class represented an Asian country to compete in chorale singing and dancing. 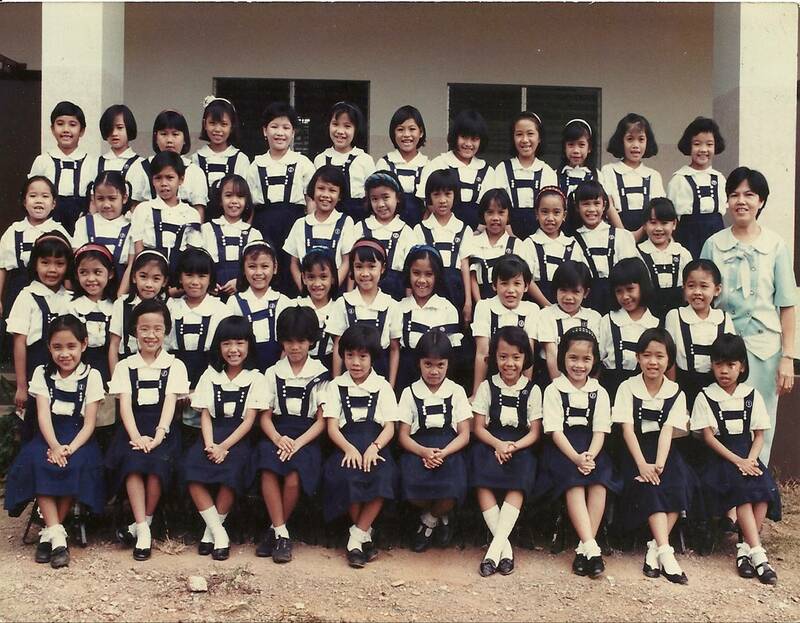 Our’s was Brunei, and for a long time I still had the costume we used in dancing. We were lucky to have Jac with us, who researched and taught the choreo. As for the chorale singing, Melanie, who was as exceptional in singing as Jac was in dancing, guided us with the voicing and all. I had too many wonderful memories in 3rd year, not to mention that Mrs. Tingson had been such a supportive adviser. Somehow, though I lacked points in extra-curricular activities, she managed to back me up in getting to the honour rolls. As a matter of fact, I did experience being rank 1 in 3rd year, 3rd quarter! 🙂 Again, as in most of my happy memories, I did not dare ask how it happened which is mostly because of divine intervention. I just enjoyed the subjects Chemistry, Geometry and Advanced Algebra, that’s all. Believe it or not, I used to spend my past time reading the 4-inch thick Chemistry textbook even on Christmas break (hehehe) and treated the Geometrical proving as one would treat Sodoku. Plus, we can’t disregard the inspiration factor perhaps. 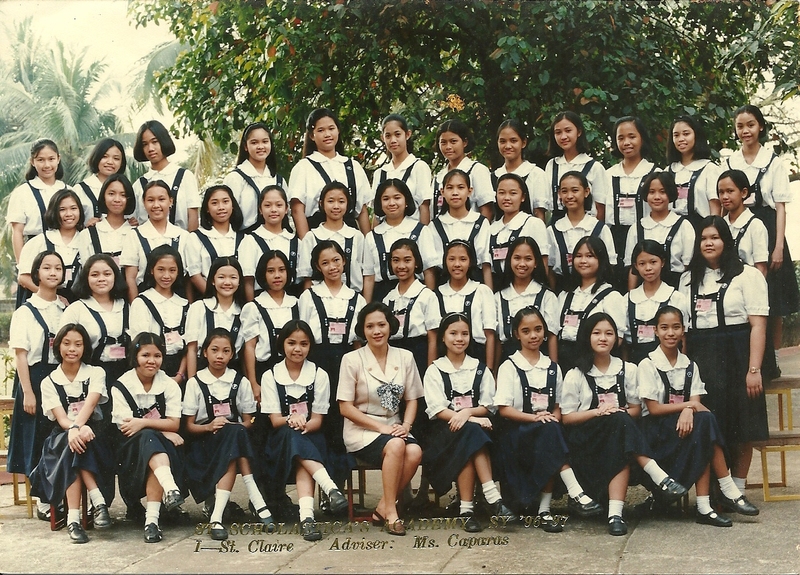 This photo was taken at the Quadrangle with Miss Bermudez (THE) as our class adviser. 4th year didn’t start as happy as I expected, for one thing, I didn’t have my Bes around to make the days worthwhile 😦 Thanks to the new and existing friends though, like Jen, Tawa, Tani, Kathleen, Sheryl and the others friends from 1st year who helped me cope until graduation. But just the same, as anyone would understand, it isn’t the same without your best friend. The COMTAG plays were also worth looking forward to. I commend even now the ingenuity of the member students who use flash lights and coloured cellophanes for lighting effects, as well as the amateur sound effects that left me captivated as I watched the COMTAG members act. How I admired and loved their plays! 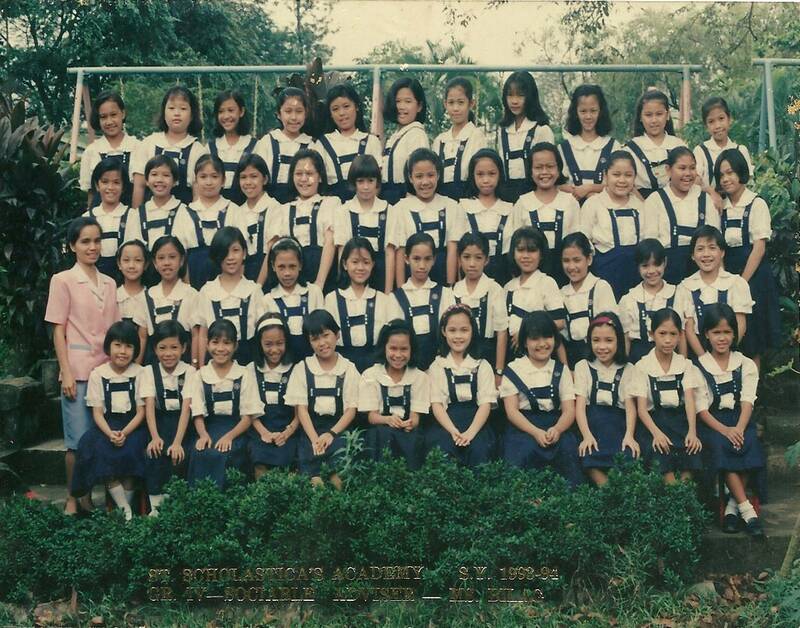 There’s just so many memories in St. Scho to tell everything. 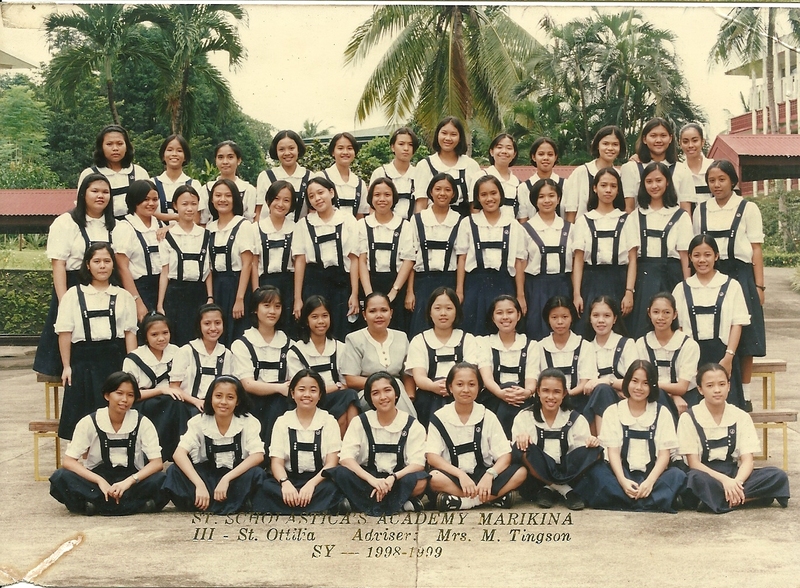 Some are common to students of all generations like the calling of “Miss” to all teachers, and the horror stories like the phantom girl in the 4th year CR, who repeats you as you say your “hail Mary’s” and the crime of passion (a love triangle) committed in the HS lab during one of the HS dance. Habits and stories passed on from student to student without the need to be questioned. One of the things I have been blessed about in life is having Nilo as my husband who’s not only an externally attractive being but also an exceptionally beautiful soul. Not that there is a need to explain, but to justify the claims, his being attractive is dependent on the eyes of the beholder while his being a beautiful soul is evident on the fact that he could bear my very frequent state of petulance. I couldn’t ask for more than his being a naturally concern father too and with these basic attributes, he got me devotedly, hook, line and sinker. Good boys deserve a treat, and so last May 22, Sunday, Dear took a rest off from the frenzy of domesticated life and went out for a night swimming. At first thought, I was delighted to hear that my husband’s male friends would be coming over for an outing because he really needed this break. But things turned a little uneasy in the end which made me realize certain things. The party initially included bro. Rolly, who was also our “ninong” in our wedding, bro. Danilo, bro. Joy and bro. Bok, who went over at the house first to visit us and see the kids. Because I needed to tend for the kids, I couldn’t go with them 😦 But perhaps it’s also for Dear’s best interest that I have to stay at home because he took a rest from my mood swings also. For several hours after he had informed me of their arrival at the resort, I kept thinking what my husband’s probably doing then, and the more I kept thinking, the more I get agitated and I constantly checked my cellphone for a call or message. None of it turned up, of course. When you’re wet all over, you don’t often take the phone with you unless it’s water resistant, and I haven’t seen a phone as such. In short, I was being unreasonable [again]. My husband, on the other hand, did enjoy the company, asking sis. Gelai (she stayed at the cottage the whole time) all the while if I had messages for him. Now, I’m feeling guilty for acting such a sourpuss. By 1am, his friends had dropped him off back to our house where I received him feeling a little bit crabby. Yep, his vacation from my mood swings was over. I know I ought to be happy because my dear had enjoyed the night, but I can’t help feeling a bit jealous. In the end, I think I tainted his bubbliness a little [okay fine, I destroyed it] with my childishness so I’m feeling rotten even as I’m writing this down. To make things end well, I had to shake myself to my senses and pick up the lessons I had to learn. One thing, this incident made me realize that I needed to be a little more soft in “possessing” him no matter how much I love him to give way to his happiness that I could not solely provide. Another, our separation even for just a few hours made me realize also that it will always be a nice feeling that at the end of the day, no matter who my husband spent time with, we will always be his home, and he will always come back to us. At the bottom line of these things, I shall be looking forward to my boy’s next night out with his friends for when that happens, God willing, I will remember my lessons well.